Evening cocktail parties are relatively easy to dress for—there's even the term "cocktail dress" to help you figure it out. But what about formal luncheons? These daytime events are great for business and personal networking opportunities, so dressing to impress is essential. Here's what to wear to a ladies' luncheon so you'll be remembered for your contributions—and your impeccable style. At business luncheons, expect professional dress, often leaning toward more formal business attire. Some perfect options include a skirt suit, a shift dress with matching jacket, a well-fitting pantsuit or a put-together pencil skirt, blouse and cardigan. Finish the ensemble with simple gold jewelry and a sturdy leather handbag. Attire for charity luncheons is often less corporate than what's expected at a business luncheon. Floral dresses, light cardigans and feminine styles and colors are all acceptable, but you can also opt for more business-like outfits. Either way, keep it conservative; choose modest necklines and knee-length hems, and wear a cardigan or jacket unless the event is during summer. Colorful handbags and jewelry are appropriate. 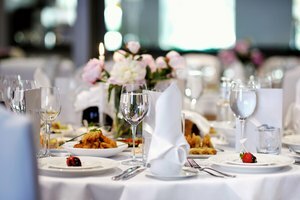 Formal social luncheons, like a bridal or baby shower, have a more liberal dress code since you're typically hanging out with friends and acquaintances. A cute and feminine dress worn with low heels and your favorite accessories is a wonderful choice. Let your style and personality shine through. Sometimes the invitation doesn't provide much information or you simply don't know what to wear. If you're unsure, it's hard to go wrong in something classic. A black sheath dress, low heels and a cardigan or jacket fits in beautifully at both a charity luncheon and a business luncheon. If you add a colorful scarf and chic handbag, the look can even go to a more relaxed social lunch.